Marketers need to avoid herding-like mentality, looking and behaving similar to competition. They need to stop benchmarking and start using a new lens to look at their value proposition and marketing mix. Packed with over 100 international examples carefully curated to inspire participants to learn from other industries and create their own innovation, the perfect seminar for brands suffering from “cut-and-paste” tactics. A must for all marketing and sales practitioners. What’s wrong with traditional strategic planning and how to reframe stratplan questions with new paradigm? What’s the function of product? Known as one of the Philippines’ most respected marketing gurus, he is the most awarded business educator of the Philippines having been recognized as one of the Agora Awardees in 1994, one of the Ten Outstanding Young Men (TOYM) of the Philippines in 2001, one of the Ten Outstanding Young Persons (TOYP) of the World in 2002 (the 1st and only Filipino in Business Education given by JCI International by far), and one of only two Lifetime Achievement Awardees by the Association of Marketing Educators (2007), the youngest marketing educator to be bestowed this honor. He was also given the Brand Leadership Award during the World Brand Congress in India (2009). His accomplishments was recognized by the international community where he has been included in the 10th edition of the International Who’s Who of Intellectuals (England). He is also the first Filipino to have completed the Blue Ocean Strategy qualification process in Insead, France and is the first in Southeast Asia to have taught this as a 3-unit, full semester course in a university. His current interests include Market-Driving Strategies, Innovation, Profit Strategy and Innopreneurship. 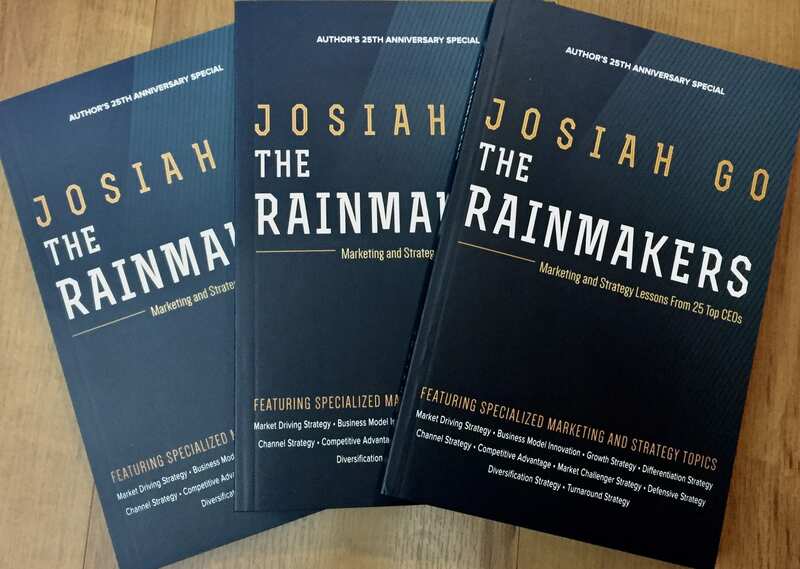 A bestselling author with 16 marketing books, Josiah has taught at the De La Salle and Ateneo Universities as well. He is an Executive Scholar of the Kellogg Business School (in Marketing and Sales Management) as well as the MIT Sloan (in Strategy and Innovation). He also took advance marketing programs at Wharton, Harvard and at the London Business School. His industry affiliations include being National President of the Philippine Marketing Association (1991), Chairman of the Direct Selling Association of the Philippines (2002), National President of the Association of Marketing Educators (2004-2005). Most recently, he is founding Chairman of White Space Club International. An entrepreneur and marketing practitioner, he continues to be involved in various advocacies aimed at youth empowerment, innovation and entrepreneurship namely, the Young Market Masters Awards (YMMA), Mansmith Innovation Awards, Day 8 Business Academy, Jeremiah Fund, Marketing Educators' Training, and the MarkProf Foundation.